Mini-ITX Chassis with 80W adapter . 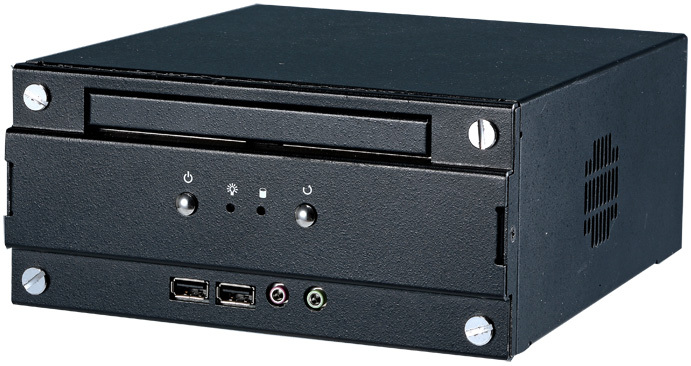 Rear Side I/O PS/2 Keyboard and mouse, VGA, DVI ( PCIE-SDVOD add-on card ) , 2 x USB, 1 x RS232 , LPT , 1 x IEEE 1394. 1 x Gigabit LAN, S/PDIF , HDTV/SDTV, Audio, DC input. 2 x PCI space for Mini-PCI card Module.